Don't take a chance! Protect your lower legs whenever you're in snake country! TurtleSkin Husky SnakeArmor Snake Gaiters are constructed from a super-tight patented weave of high-strength ballistic fibers and polyester. 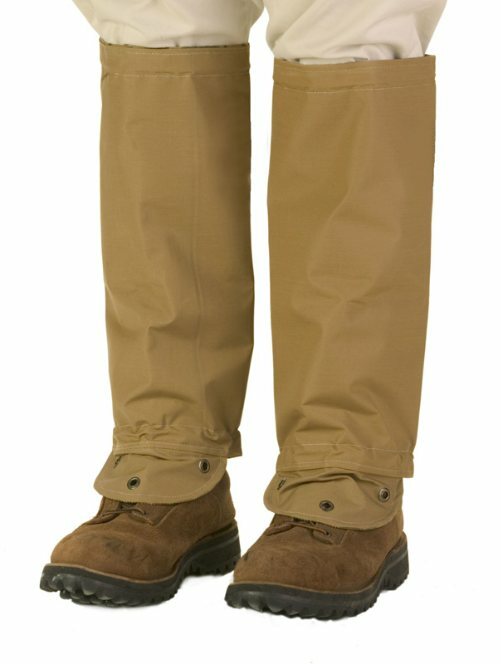 Most snake gaiters are heavy, stiff, and bulky -- but not this brand! Weighing less than 6 ounces each, these gaiters are one-third the weight of other snake gaiters, yet are tested to repel even large snakes. Made in USA. SnakeArmor gaiters are also windproof, waterproof, and flexible. Simply close up the back and cinch the elastic top for a snug fit on your calves. A pair weighs only a mere 13 ounces! Choose color options from drop down menu. Want to ship this item outside of the USA? Click here to for international orders of Husky size gaiters.